Cheryl Carpinello reviews children’s books (young children / middle-grade / tween / YA ) on her Carpinello’s Writing Pages website. Cindy Vallar “reviews maritime piracy and Age of Sail fiction and non-fiction for children and adults”. The Guardian’s children’s book section is run by children for children and includes reviews. http://motherdaughterbookreviews.com “children’s book reviews by kids and their grown ups”. http://thepicturebookreview.com/review-policy-disclosures prefers paper books rather than eBooks. 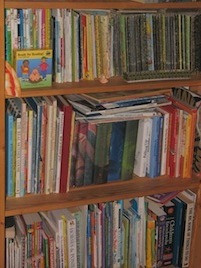 www.redpeffer.me reviews children’s books and takes part in the Kid Lit Blog Hop. Rivka Kawano (editor@beautifulbooksforchildren.com) reviews children’s picture books. Sandra Bornstein’s website http://www.sandrabornstein.com/blog includes reviews on multicultural picture books. http://www.smsnonfictionbookreviews.com specialises in non-fiction and children’s. Babar: http://revistababar.com/wp – a magazine about children’s literature that is working since 1989, first in paper and now digital. Giraluna: http://giralunamariola.blogspot.be – great blog that reviews children’s literature and all what’s related to the illustration in these books. Literatura infantil y juvenil: http://lij-jg.blogspot.be/index.html – the blog from the writer Jorge Gómez Soto. I know some of them, but they’re only in Spanish or Catalan languages. That’s OK, helpful definitely. If you’d like to send me the information, morgen@morgenbailey.com, or put it in a comment here I’ll gladly add it with a note about the language requirement. Thank you. Babar: http://revistababar.com/wp/ A magazine about children’s literature that is working since 1989, first in paper and now digital. Giraluna: http://giralunamariola.blogspot.be/ Great blog that reviews children’s literature and all what’s related to the illustration in these books. Literatura infantil y juvenil: http://lij-jg.blogspot.be/index.html The blog from the writer Jorge Gómez Soto. El bosque de los cuentos: http://elbosquedeloscuentos.blogspot.be/ The blog from the writer Aitor Galvez Farran (me). Wonderful. Thank you very much! I have added them to the https://morgenbailey.wordpress.com/reviews/reviews-childrens page. My blog http://www.sandrabornstein.com/blog includes reviews on multicultural picture books. Thank you very much, redpeffer – I’ve added you to the page.